Quick and to the Point: An hour-plus chilled Brazilian jazz affair. Brazilian guitarist Marco de Carvalho lays back on For the Moment, where he dwells almost exclusively in mounting relaxed grooves suffused with the endemic melodic tropical sensuousness so characteristic of his native country. 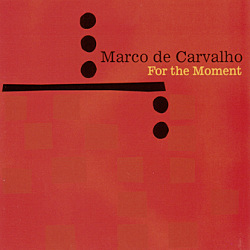 Carvalho's slow and mid tempo compositions rely on the sweetness of guitar and flute, with barely dressed arrangements exposing much classically-toned-jazzy skin without recurring to bare and smooth nakedness with the exception of the coolly tempered swing of "Fim De Ano," the leisurely "J", and the engaging "Follow the Feeling" featuring exquisite interplay between Carvalho, saxophonist and clarinetist Hans Teuber, and cellist Lori Goldston. Drum and guitar duos are featured on the beachy "Laid Back" and the brainier "Certeza." "No Past Tense" is a flute and guitar duo firmly rooted in classical aesthetics, attesting to Carvalho's education and craft in that field. Visit Marco de Carvalho & OA2 Records on the web. Personnel: Marco de Carvalho: Guitar. Lucas Robatto: Flute. Hans Teuber: Sax and Clarinet. Lori Goldston: Cello. Rick Houle: Bass. Daniel S. Carvalho: Drums/Percussion. Tad Britton: Drums Magno Lins: Timba, Tamborim & Chocalho. Antonio Ribeiro: Pandeiro. Arturo Rodr?guez: Congas.